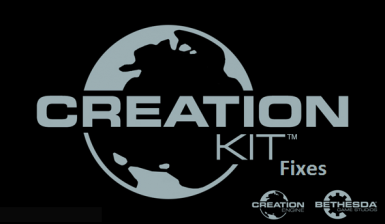 Various patches and bug fixes for the Creation Kit to make life easier. - Add experimental INI option to speed up dialog loading (mainly with multiple dropdown menus [ex. Actor, Constructible Object]). Enabled by default. - Add option to toggle log autoscroll under "Extensions"
- Fix Windows 7 users getting an error about "PrefetchVirtualMemory"
- Significantly decreases time while loading plugins. - A fix for dialogs suddenly not opening. This is from a resource leak after opening too many dialogs and not restarting the editor. - Ability to replace the kit's default memory allocator with a custom one. - Ability to save master plugins (.ESM) files directly from the save dialog. - Ability to edit plugins with ESP files as masters without them being removed. - Ability to globally disable assert message boxes. - Ability to skip topic info validation which significantly speeds up first-time validation. - Ability to disable automatic facegen on save. - Experimental patches that will come and go over time. Q. I already have tbb.dll or tbbmalloc.dll in my Skyrim folder, are they compatible? Q. Will you port this to Fallout 4 or the 32-bit Creation Kit? Q. What version does this require? A. The SSE CK version 1.5.3.0, released on 2018-04-13. Q. The CK says I'm missing FonixData.cdx, where is it? A. See the README included with FaceFXWrapper.